This video demonstrates the principles behind the SpinLight 360® and how to use it to get the lighting you want on your subjects. 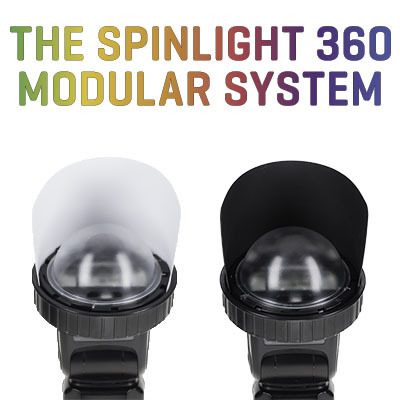 The SpinLight 360® Modular System is completely unique and different from any other modifier on the market. Understand it’s true power over all the others with this quick overview and see why you should have one on your flash! The SpinLight 360® not only softens the light toward the subject, but bouncing the light on surrounding surfaces around the subject is quick and easy, while also simultaneously isolating and blocking the subject from the direct on-camera flash, something NO other system can do. Think about it, with one quick motion SOFTENING THE LIGHT, DIRECTING THE BOUNCE FLASH, AND AT THE SAME TIME ISOLATING THE SUBJECT! This is because only the SpinLight 360® Ring Module has the capability to simultaneously add cards, modifiers and gels, and has the unique 360-degree spinning ability to move the cards and provide this fantastic feature. A direct on-camera flash produces harsh, unflattering light on a subject’s face. However, utilizing surfaces around your subject while simultaneously blocking the direct on-camera flash to the subject, will dramatically improve the light quality. By bouncing the on-camera flash, we introduce a bigger light source, which is flattering to the subject, as though using a soft box. By blocking the direct flash light simultaneously, the flash hitting the subject in this image is coming from camera left only. Here we wanted to integrate the beautiful background, bounce the flash-light onto the side of the stairs so we could have the light hit the subject from camera left, and we wanted to eliminate the direct on-camera flash light. A lot to ask from a flash modifier and impossible for others, but not for the SpinLight 360®! This beautiful portrait was shot with an on-camera flash ONLY using the SpinLight 360®, no soft boxes, reflectors or other equipment were used. As you can see in this top-view animation, rotating the SpinLight 360’s Ring gives us a quick and easy way to bounce the light in all different directions. Every time we rotate the SpinLight 360® with a card attached, we are bouncing the light in one direction, while we are blocking the light from the other direction, letting us precisely control both the light’s direction and quality on the subject. Light bounces in a 3-D space so let’s look at this side animation which illustrates the main light paths. As you can clearly see, the light emitting from the flash has 2 distinct directions, the bounce up toward the ceiling, and the light from the opening of the bounce card. How we rotate the SpinLight 360® Ring and manipulate the flash-head gives us incredible flexibly and control over the bounce light. The better we understand how to control the light’s direction and take advantage of the surfaces around us, the more beautiful lighting quality we will get on our subjects. The SpinLight 360® allows this smooth and incredible control on the fly, with only a quick turn of the Ring. Here’s an example of how you can create different looks with the SpinLight 360® while staying in the same location, with the same setup. For this example we’ll use the clear dome and white card. If we point the flash directly at the subject, as you can see in the image on the left, the light hitting the subject will come from both the ceiling and directly from the on-camera flash. Or we could rotate the card to totally block the subject from the direct on-camera flash, but allow the bounce flash above the subject’s head to be the dominant light source. If we rotate the flash to the back instead, this will shift the ceiling bounce further back, as you can see in this animation, and help clear the shadows under the subject’s eyes. Or we can rotate the flash-head to the right side while the subject is exposed to the direct flash light. To easily eliminate the shadow under the chin, we’ll rotate the card 180 degrees, which will block the subject from the direct on-camera flash, and at the same time change the light pattern. Now the light will bounce onto the wall at camera-right and the back wall, which surrounds the subject with a beautiful soft light. We’ve shown you one setup but the amazing SpinLight 360® Modular System allows you to use many types of modifiers and gels, with or without cards. When photographing children or animals who are active and in motion, or a large group portrait, your best setup may be simply the white dome or the clear dome pointed directly at the subject, without a card. If you’re shooting portraits and require a hairlight, you may want to set up a second SpinLight 360® with a grid or snoot attached on a stand, or have it held by your assistant for this purpose, as we did for this image. If you’re shooting high-key portraits you can do so with 4 SpinLight 360’s, 2 at the back, 1 hairlight and 1 main light on camera left. Think of how compact and portable your setup would be without needing those large softboxes. With different domes, grids, snoots, gels and cards to choose from, the SpinLight 360® offers incredible lighting options which can be used individually or in combination with one another. It couldn’t be easier for you to get great lighting and you’ll see the incredible results instantly! Whether you’re shooting events, portraits, fashion or food, the amazing, easy to use SpinLight 360® will dramatically improve your photography and give you photos you’ll love and be proud to display. It’s a must have for professionals and amateur’s alike! I just posted information about Spinlight 360 Exttreme to my blog. Overtime, which is a long time at the age of 73 I have had a variety of products that I used for modifying speedlights, but the only one that remained with me as the simplest and most complete is yours. Unfortunately I just made a move to new living spaces and somehow a bunch of photo gear disappeared including the small case I kept your gear in. I shall eventually replace it as I get settled in and funds are available. For a few years, shooting the Fuji X system I strayed from using flash favoring available light for street photography. But being that the best available light in the world does not necessarily replace the most available light which is my flashes. I never use more than two flashes as I really want life to be as simple as possible. To be perfectly honest, I have tried the Magmod system, Gary Fong and Honl and have done reviews on those, but nothing has yet inspired me to use more flash than your system so kudos to you and your staff for making a simple and complete product. As soon as I have the available funds I shall getting the Spinlight 360 and writing a full review on your products.